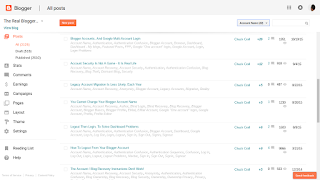 One of the most intriguing subjects, in Blogger Help Forum: Get Help with an Issue, is about account access - and the dashboard menu. My menu only gives me Posts, and Settings! How do I manage my blog? This blog member (owner?) may be simply logged in to the wrong Google account. Google lets you login to multiple accounts, as you wish, using the same browser. Many Google services - but not Blogger - let you login to different Google accounts. You can login to services like GMail, Google+, and YouTube, under multiple Google accounts - and each service will use the proper account, reliably, when you change accounts. Blogger does not support this feature - nor does Google Apps. You may need to use multiple browsers, with Blogger and Google Apps. When you login to Blogger, and you are logged in to another Google service, using that browser on that computer, you may or may not have to use Google "One account" login. If you do not use Google login - or you login to the wrong Google account, your Blogger account will be the one associated with the Google account that was most recently logged in. If you're using Google "One account" fully, you'll have multiple Google sessions open in different tabs and windows - and which session becomes the Blogger account may vary. You may not notice the difference, until it's too late. If you're already logged in to Google, Blogger may not require you to login again. 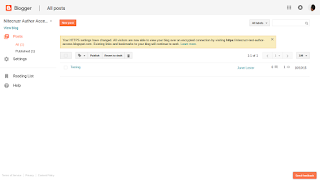 If the Google account that was most recently logged in corresponds to a Blogger account that is a blog administrator, you will get an administrator menu - and be able to edit all posts, the template, and so on. If the Google account that was most recently logged in in corresponds to a Blogger account that is a blog author, you will not be able to do anything but create and edit your own posts. If the Google account that was most recently logged in corresponds to a Blogger account that is not a blog member, your dashboard will be without the blog - and you will be unable to continue. Why can't I edit all of my posts? How do I add gadgets to the blog? There's no Layout page! We'll ask for a screen print of the dashboard menu. If you are logged in as an author, you can logout, then login properly. 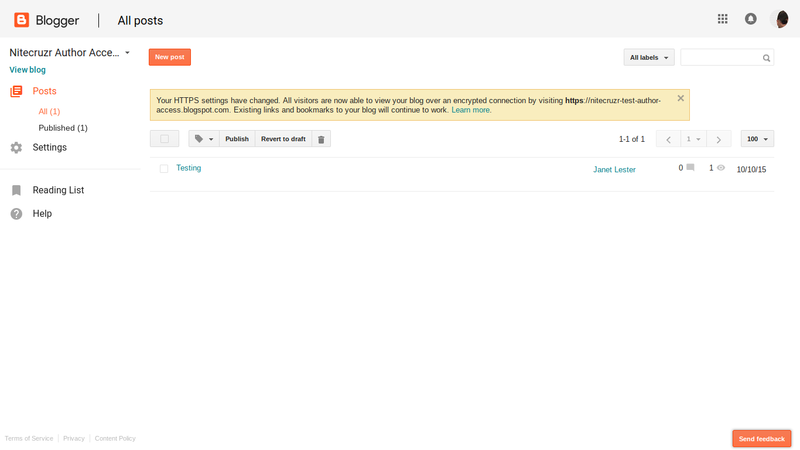 Logout from all Google products - then login to Blogger, using the administrator Blogger account, for the blog. You need to be logged in to the correct Blogger account. It's that simple. I'm an author, on this blog. I'm an administrator, on this blog. See the menu differences? If it's your blog, you will prefer the latter menu. 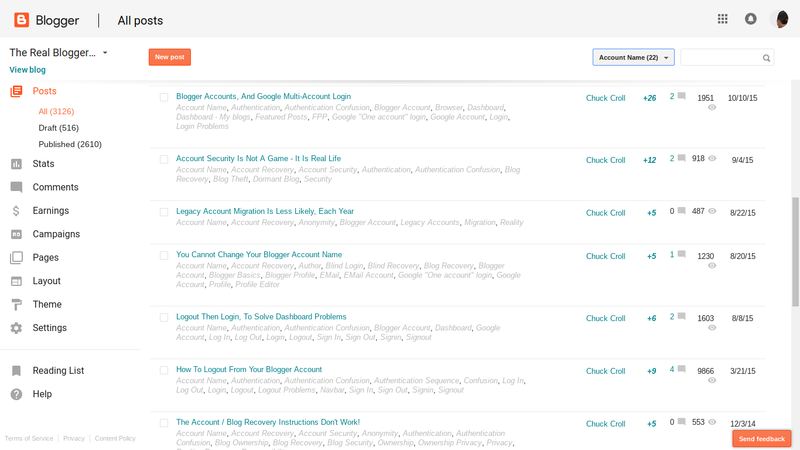 Logout, then login carefully, to be logged in to the right Blogger account. If you logout from all Google products and services, then you deliberately login to Blogger, you can be logged in using the right account. And this way, you can avoid the many side effects of clearing cache, cookies, and sessions - and restarting the browser. You may find Blogger Help: Having trouble signing in or viewing your blog? to be useful, in some cases. And knowing how to identify the owner of a blog is useful, also. Help. I have lost two blogs. A "lost blogs" issue can take some back and forth discussion, to diagnose. This discussion really should be conducted in Blogger Help Forum: Get Help with an Issue, where we can diagnose and resolve much easier. Just found this post after hours of searching for an answer. I have 2 Google accounts, and struggled to log into the correct Blogger page. Now, with 2 different browsers, I am set. Thank you! I am blaming our major move across the States in the last year to my inability to get logged into my blog. I am the author, the administrator of a private blog. I do know there were 2 emails listed for this blog. The one email has since been eliminated because we changed carriers. I have attempted to log in using the 2 emails I have on file and I have updated/changed the passwords as well. There is no way I can add these 2 emails to my "administrator" because I can't even get into my blog. I know the blog is still there because I attempted to start a new blog under this name, and it is not available, which is a huge relief, but I am also very worried as I have 5 years worth of blogging done, which I want/need to make into books, but I can't get to my blog. When I have attempted to log in and I get a message stating the log in information has been sent to the two emails on file, I am NOT receiving instructions. By the way, the one email no longer exists. I am even searching spam. I am at a loss. Please help!